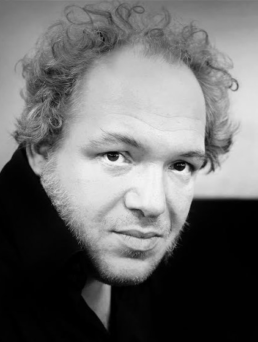 Mathias Énard is a French writer and translator, he studied Persian and Arabic and spent long periods in the Middle East. His novels received many awards – the notable one is The Goncourt Prize in 2015 for his novel Compass. It was the work of those alchemists from long ago who, Adrian claimed, succeeded in bottling the essences of nature: the ocean at low tide, the early morning forest, a wheat field after rain or—the most difficult of all, Adrian insisted—the smell of snow. The smell of snow on a very cold evening—Salma shivered, admiringly. They had already mentioned a summer’s night, straw, a mountain waterfall, and were imagining the possibility of a concentrate of shooting star. “Powder of fleeting comet,” added Adrian, a little pompously. Sitting in the shade of the hut, where the garden (skittish palm trees, proud hibiscus, jasmine spangling the heat with white flowers) almost brutally gave way to the desert (where solitude was invented, said Adrian), Salma and Adrian were dreaming of the smell of snow, since despite the gentleness of the palms, the temperature was slowly covering their bodies and minds with a mellow boredom; the ground between the date palms was warming up with a false mist, a quivering in the air that seemed to climb the nearby dune in tiny sandstorms, as if a brood of snakes were striping it lasciviously. Salma was discovering the oasis, the solemn coolness of evening, the stifling bell jar of noon when nothing moves, the horizon blinded by the brilliant silence of light, the morning of shadows, and the taste of mud and red earth when water is released into irrigation channels to water the plants. Adrian was discovering Salma, her skin with its gleam of African wood, shiny and dull at once, with its secret perfume, the way you find cardamom seeds hidden between two white cotton sheets which suddenly fill the air with fragrance. Her sweet languor reminiscent of an autumn date. The oasis outlined a very definite border, a precise frontier between earth and sand, fire and water—it unfurled around wells and wove between the low raw-brick houses, the forgotten churches, the mosques raising their minarets like the shafts of date palms; the oasis flowed into lotuses, into slender papyrus with green, pointy stars, into fragile rushes that trembled in the evening breeze; the oasis blossomed from mauve, yellow, pale lily-orange one day to the bold red of Karkadé hibiscus, and smelled by turns of donkey, rubber, death, or—this is when Salma almost fainted from pleasure—of all the nuances of the different jasmine plants: the sugary Foll, or Arabian jasmine, and the spicy Yasmin, mixing at night, in a long love song, with the nighttime gillyflowers, plump and heady— and all the goddesses and all the angels, Salma imagined, crossed the desert to come flitter gently about in these wafts of scent and get drunk on them. The ground was turning clay-red, the sky’s blue purity dwindling, and all around, following the clearings and curves, the sand was piling up like an outstretched wall. For Salma, the desert was as beautiful and unattainable as an image in a mirror. There where solitude is invented, said Adrian, no one can venture. It is pointless. It serves no purpose. Adrian evaded the question and steered the conversation to those old Arabic alchemists who, he asserted, had managed to concentrate all fragrances. Salma lay down on her back, hands under her head, her bare calves on Adrian’s thighs, and prepared to be extremely attentive. She could feel a drop of sweat pearling between her breasts. Salma closed her eyes and inhaled the sticky air of the oasis. Adrian’s voice and accent caressed her like an ointment. Adrian paused. Salma’s legs were burning, and felt like liquid on his own. In the distance, behind the palm trees, the desert was a world of dragons. A swarm of tiny insects was flitting about in the long shadow of the date palms. Salma imagined the sweetish, delicate, deep taste of orange-colored fruit in the fall. Their softness. She asked for the rest of the story. Salma worriedly observed a hoverfly, motionless and stubborn, a meter above, which seemed to be challenging her. Adrian reassured her it was nothing but a fly disguised as a wasp. Absolutely harmless. Adrian picked up the clay jug and poured ice-water over Salma’s legs, then sprinkled himself on the chest. Once the dipteron had moved away, Salma couldn’t help but look far ahead, towards the sands, as if trying to see Theodosius’ ghost at the dazzling crests of the dunes. Adrian stroked Salma’s belly; he dipped a finger in the water and drew cool circles on the young woman’s skin. Salma tried to imagine a flask capable of containing all these instants, all these sensations. The essence of the oasis is the mirage, she said to herself, and this fleeting thought evaporated in the humid noon heat, in the song of the muezzin and the endless throbbing of insects. Quickly, as Adrian was getting up to refill the clay jug, Salma let herself give in to the frail sleep of happy torpor.